No matter what style or design choice you are going for, you simply cannot go wrong by selecting our classic plantation style shutters! Why? It’s simple – visual appeal and functionality. Our plantation style shutters not only have long-lasting finishes and exceptional craftsmanship, but also grant you control over the amount of privacy and sunlight that fills a room at any time of the day. Choose from our three unique style options: Heritance Hardwood Shutters, NewStyle Hybrid Shutters, or Palm Beach Polysatin Shutters. Each collection of shutters offers the same structured lines and refined look, as well as exclusive features for every home’s unique needs. No other window treatment can uphold the sophistication, maintenance, durability, flexible privacy, and light controls than these classic shutters. SmartLooks offers an array of paint finishes, styles, and stains in Hardwood, as well as several finishes in the Hybrid & Polysatin Collections that will allow you to maintain visual cohesion both internally and externally. HERITANCE® Hardwood Shutters– Classic Heritance® hardwood shutters are plantation-style shutters crafted from real wood and use dovetail construction for maximum strength and durability. Available in a large selection of stain and paint finishes. PALM BEACH™ Polysatin™ Shutters– Our Palm Beach™ Polysatin™ shutters are plantation-style shutters constructed with UV resistant Polysatin™ compound, so they’re guaranteed never to warp, crack, fade, chip, peel or discolor, regardless of extreme heat or moisture. 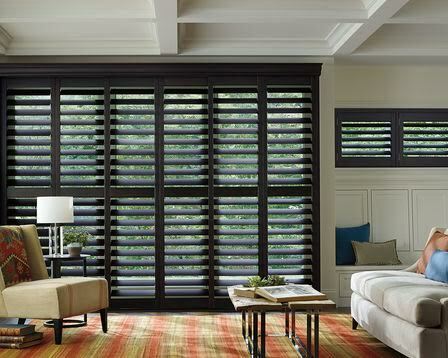 NEWSTYLE® Hybrid Shutters– The value-priced NewStyle® hybrid shutters are plantation-style shutters that blend the beauty of real wood and advanced modern-day materials to create a stunning and durable window covering for any room.